At Vanguard Dental Group, our Derry patients are treated like family. We are Dr. Rothenberg and Dr. Moskowitz, and our relationships with our patients are paramount. You know what makes us smile? When we use advanced cosmetic dentistry to create a dazzling smile makeover for one of our patients. We and our staff at Vanguard Dental Group can guarantee you quality preventative, restorative, general, and cosmetic dental care. 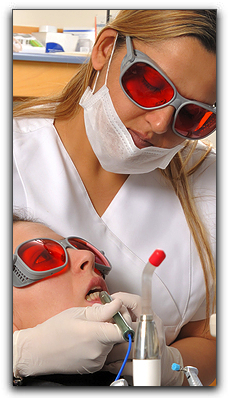 In today’s Vanguard Dental Group blog we would like to discuss laser dentistry. It may sound scary, but laser dentistry provides an excellent alternative to drills. Many procedures performed with lasers don’t require Derry patients to be medicated, allowing for quicker healing times. Many Derry patients become very anxious waiting for a shot of painkiller before a dental procedure. Laser dentistry allows for a more relaxed, less stressful dental visit. Our patients also appreciate not going home with a numb mouth and drool dripping down their chins. Derry residents in need of oral surgery will experience less bleeding thanks to laser dentistry. Some of the procedures that are performed with lasers are infected root canal treatment, gum and bone reshaping, uncovering erupted wisdom teeth, and teeth whitening. At Vanguard Dental Group our most popular service is sedation dentistry. We also offer smile makeovers, dental implants, family dentistry, and sleep apnea and snoring treatment. Derry patients who want to experience a comfortable, relaxing dental visit and receive compassionate and professional dental care, contact Vanguard Dental Group today. At Vanguard Dental Group we treat you like family. Hey, Derry, Smile Like You Mean It! Is Manchester Flossing out of Fear?